It's Windows 9 everywhere. 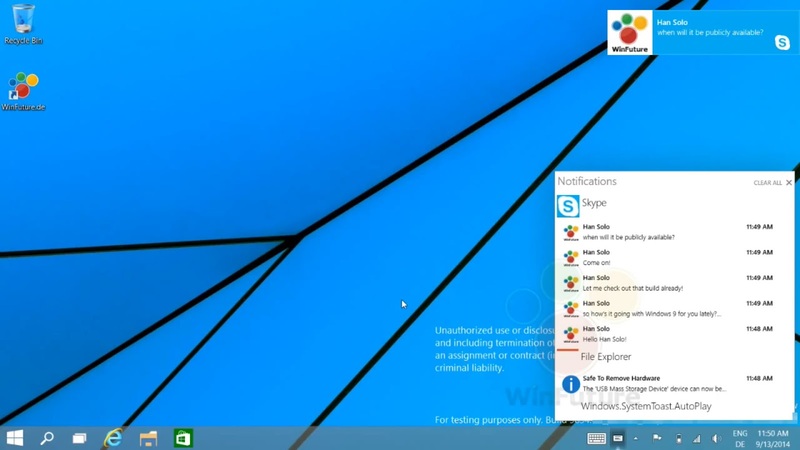 One more video from WinFuture shows us how the Notification Center in Windows 9 works. Windows 9 is making headlines often these days and it comes with a set powerful features which will appeal the consumers to switch from older version to the latest of Windows family. The notification center is a major improvement over the notifications seen in Windows 8.1. Now you can see what happened and what is happening right from a single notifications Windows which sits in the taskbar. It seems that all the pre-installed apps have been updated to give notifications which can be recorded in the notification center. This feature was one of the most rumored feature for Windows 9 when talks started about it.It's getting better as we talk.